The Catholicon, written by the Dominican Johannes Balbus (d. 1298) of Genoa, is a long treatise for the study of Latin, divided into five parts: orthography, prosody, grammar, rhetoric, and etymology. 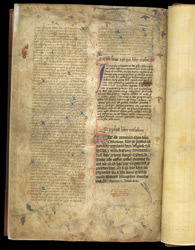 This copy was owned by the Augustinian priory at Stone in Staffordshire (half-way between Stoke-on-Trent and Stafford). A puzzling feature of this manuscript is the style of illumination. The repertoire of ornament is basically English, but some of the colours are unusual, and the figure-style, as for example in this initial, are extremely Italian. Since the script is English, we must assume that the decoration is by an Italian-trained artist working in England.